CONVERSATIONS (CwHD) is a weblog about words and language and other nonsense. CwHD began May 1, 2017. Besides thematic essays, the site provide a vehicle for sharing my own words and language. In July, 2017, I opened The Bookstore. This page provides an overview of my published work. Print and ebook copies are available through my publishing website majikwoids. A link is provided in the sidebar. Previously, I listed the six most influential author's of detective stories. This week's post continues the biographies of those writers. 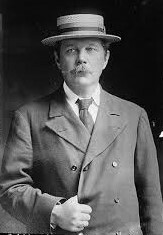 Sir Arthur Conan Doyle was born in Edinburgh on May 22, 1859, just a year after Wilkie Collins published The Woman In White. His family was impoverished largely due to an profligate father who gambled and drank. Nevertheless, Conan Doyle managed to receive a good education at a Jesuit school despite the sometimes brutal physical punishment that was meted out to the school's students. With an absent, errant father, mother and son formed a strong bond. From her he learned to appreciate the art of story telling, and managed to publish his first story while still a student. Though he studied to be doctor, his medical practice was never on solid footing. While in London, writing stories rather than prescriptions, he managed to sell 'An American Tale'. "It was in this year," he later wrote, "that I first learned that shillings might be earned in other ways than by filling phials." Well educated, well read, and soon to be well traveled, Doyle became a man of many interests. At twenty, he made a voyage to the arctic as a ship's doctor. While repulsed by the slaughter of seals, he relished the shipboard camaraderie. That voyage " ... awakened the soul of a born wanderer ... "
In 1886, he began a novel which would make him famous. Originally entitled A Tangled Skein, his protagonist was named Sheridan Hope. His crony was named Ormand Sacker. 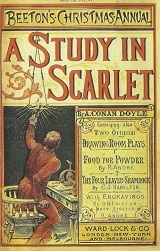 The book would be renamed A Study In Scarlet, and the characters would become Sherlock Holmes and John Watson. With the immediate success and celebrity of Holmes, Doyle faced a dilemma. The detective stories, as a genre, even then were considered "commercial" works; and Doyle wished to be considered a 'serious' writer, a literary man. So in spite of the financial rewards of the Holmes' stories and a now flourishing medical practice, Conan Doyle was restless. He moved to Vienna with his wife and daughter and set up a practice, which failed rather badly. The inactivity, however, gave him a good deal of idle time to think. He made the decision to write a series of stories with the same characters. 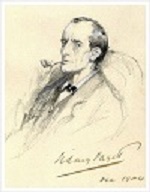 The Strand magazine agreed to publish, and Sherlock Holmes and Dr Watson became the obvious protagonists for the stories. The collaboration between Doyle and The Strand became an immediate success, lasting for many decades. In May, 1891, he suffered a severe bout of influenza; and Conan Doyle came to the realization that attempting to combine a medical career with a literary career was too daunting a task. His choice was easy: he gave up medicine and concentrated on writing. Despite the success of Sherlock Holmes, Doyle began to feel oppressed by his character. By 1893, the demands to write more stories were constant. His solution to the problem was to kill the golden goose. In what was entitled 'The Final Problem', Holmes and his arch enemy Moriarty fight and both fall to their deaths into the Reichenbach Falls. Subsequently, 20,000 subscribers to The Strand magazine cancelled their subscriptions. Relieved to be rid of this burden, Conan Doyle traveled and concentrated on his 'serious' writing. The death of his wife and son led him to the occult. As he grew older, more and more of his time and energy were spent delving into the mysteries of the afterlife and going off on what he termed 'psychic crusades.' It was estimated that he spent a million pounds ($30 million in today's money) on his esoteric studies. Curiously, Holmes, too, had his 'afterlife.' Whenever Conan Doyle ran short of funds he would trot out another Holmes' story and replenish the coffers. Four novels were published as well as six short story collections. His 'science of deduction' became the standard for all other detectives until the 1930s when detection and detectives took on a darker cast.